Why do some eggs have white shells, and some eggs brown shells? The ear lobe of the mother hen determines the color of the egg: white ear lobes, white eggs; brown ear lobes, brown eggs. You can easily test this by reaching under a lot of hens—it works every time. Our eggs are blue, green, pink, and dark brown. But our eggs are not beautiful because of the color of the shells, or the ear lobes of the mother hens. By the early 1980’s, grocery stores sold only white eggs on their shelves. That was because industrial egg factories produced only white eggs. 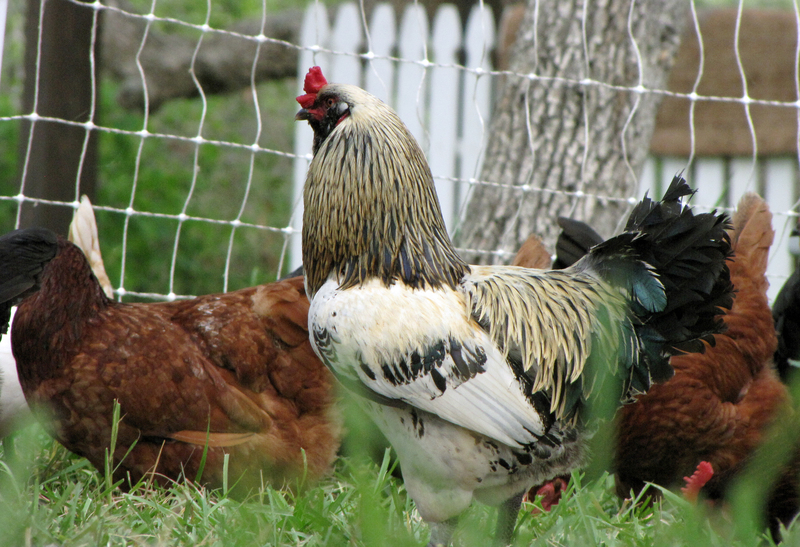 The hybridized hens developed by corporate scientists were designed to be as small as possible, and therefore consume less feed, to save expenses. These industrial hens were descended from white layers, so they laid white eggs. Every grocery store in America carried white eggs, not because of quality, taste, health, or concern for the treatment of the hens, but simply to cut down on expenses. Taste and health, as anyone who ate these eggs could tell, were not priorities for the egg producers. Eventually, however, the industrial egg conglomerates faced a big problem: their white eggs earned a bad reputation among consumers due to the hormones, steroids, and antibiotics fed to the hens, not to mention the filthy and inhumane conditions of the egg factories. White egg sales declined. Research by the egg conglomerates revealed that American consumers believed brown eggs were “farm eggs”, as opposed to “white grocery store” eggs. The egg corporations capitalized on this consumer perception by introducing brown layers into their factories, and rebranding their product as “farm eggs”. There was nothing different about the inside of the eggs; they were still full of antibiotics and pharmaceuticals. The egg factories were as filthy and inhumane as ever. But the corporate rebranding to brown eggs worked. Brown egg sales soared, and soon brown eggs were as common on grocery store shelves as white eggs. And all the egg factories had to do was replace white ear lobes with brown ones. The egg corporations actually made money from this rebranding, because they sold “farm eggs” for a substantially increased price, much greater than the miniscule increase in feed costs for brown layers. The brown eggs sat next to the white eggs on the grocery store shelf, and cost ten to twenty percent more, but the inside of the eggs did not change a bit. We keep a wide variety of laying hens on our farm, and even their names are beautiful: barnevelders, cuckoo marans, ameraucanas, black langshans, black australorps, Rhode Island reds, dominiques, barred rocks, and more. We continue to add new varieties all the time. Diversification in the henhouse increases the health of the flock just as diversification in the garden increases the health of the soil. Some breeds fare better than others during the intense summer heat in Rockport, and some breeds take to pasture and forest better than others. By selectively introducing breeds, we can easily track the ages and production of each cohort. A natural selection based on climate, soil, native forage, and other localized factors helps us build the healthiest possible flock. 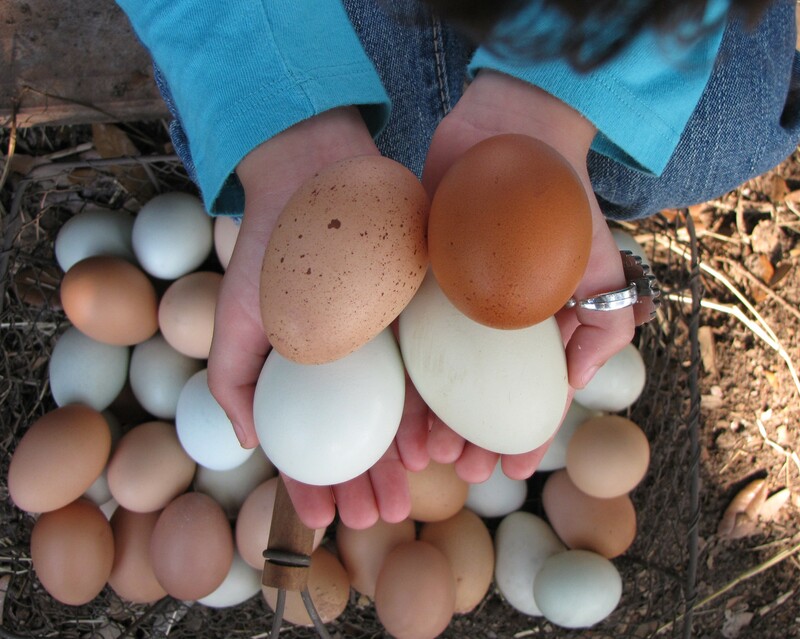 The diversification of our flock gives us a wonderful variety of color in our egg shells: blue, dark brown, green, and pink with purple freckles. Our hens live in the fields and fresh air and sunshine of our farm. Their diet consists of grass, weeds, bugs, produce from our gardens, and our customized feed ration. 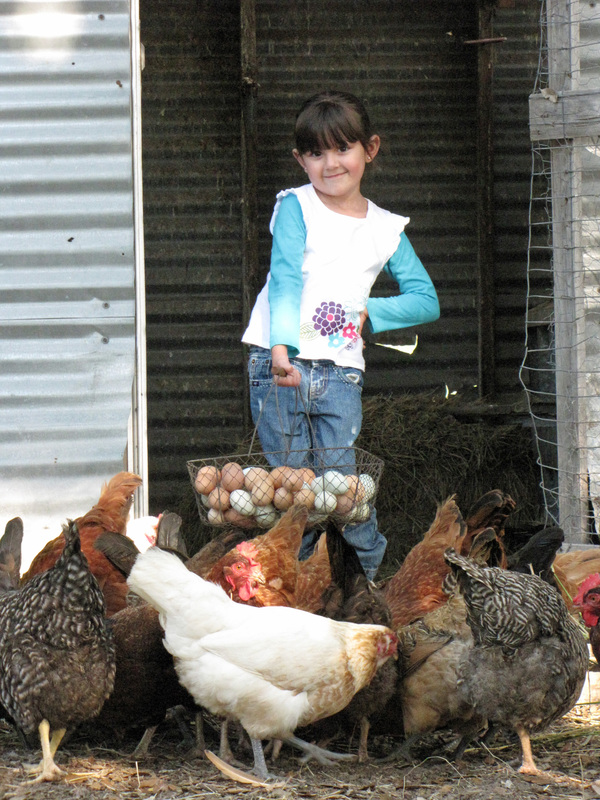 Our hens are routinely rotated onto fresh garden space, where they eat down the remaining harvest and green material, and fertilize and cleanse the soil for the next planting. Our eggs are a pure distilled taste of Rockport, as fresh and healthy and delicious as any eggs anywhere. Our eggs are beautiful, but not because of what is on the outside. They are beautiful because of what is on the inside.